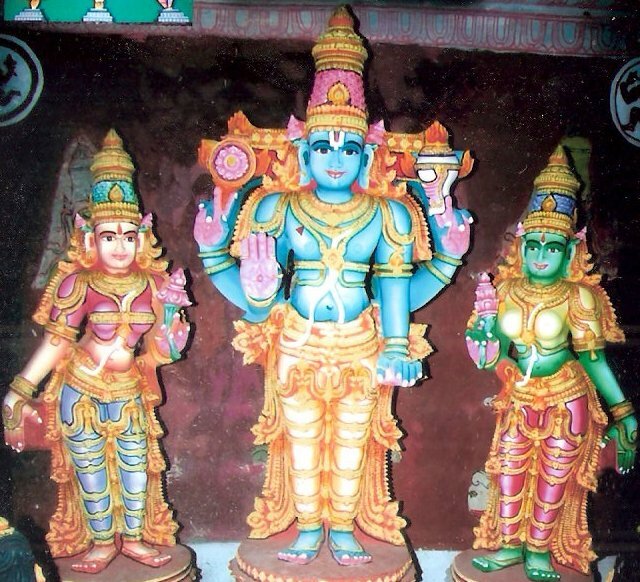 Are there any temples for the following three avatars of Vishnu? If yes, please share some information about some popular temples for them. Yes, there are temples for all three. After eulogizing the Lord thus Goddess Earth [Vishnu's wife Bhumidevi] saluted him (falling on his feet. On seeing her saluting the eyes of The Lord beamed with delight. He lifted up Goddess Earth with her arms and Embraced her. Her sniffed the face of [Bhumidevi] and placed her on his left lap. He then rode on Lord Garuda and went to Vrishabhachala. The Lord of the Earth was Eulogized by the leading sages beginning with Narada. On the western bank of Swamipushkarini, honored by all the worlds, remains seated The Lord having the face of Boar. He is worshipped there by the leading sages, Vaikhanasas ("anchorites") of great magnificence, noble souls on a par with Brahma. But this place became even more famous when Lakshmi abandoned Vishnu after being kicked by Bhrighu. Lakshmi came down to the Earth and started living in Adi Varaha Kshetra, and then Vishnu himself came down there to find her. He requested permission to stay in that place from Vahara (Vishnu's own incarnation!). Varaha agreed, but on the condition that anyone who worships Vishnu in Adi Varaha Kshetra must first pay his respects to Varaha. Not to keep you in suspense, Adi Varaha Kshetra is now called Tirupati, and the story I'm alluding to is the famous story of Venkateshwara. So the next time you go to Tirupati, make sure you go to that temple first. As the Skanda Purana describes, you might even see a glimpse of Varaha himself running around as a white boar! Sri Matsyanarayana Temple in Omkara Ashrama is the only temple of its kind in Karnataka of Bhagavan Sri Matsyanarayana Swamy.Matsya Avatar was the first Avatar of Lord Vishnu, among the Dashavatara of Mahavishnu. Matsya means ‘fish’ in Sanskrit and Matsya Avatar is the incarnation of Lord Vishnu in the form of Fish. If you want to pay a visit, the address is Omkar Hills, Srinivaspura, Bengaluru-60, India. The Kurmai and Kurmam temples mentioned in Keshav's answer are undoubtedly the most famous Kurmavatar temples. 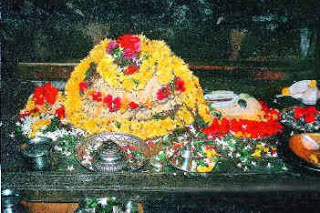 Located in Gavirangapura, the Gavi Ranganatha temple is another place where the main deity is Kurma (despite it's name). There aren't many resources available about this particular place, online. I found a small slideshow of a few pictures from that place. There is another YouTube video from inside the temple. According to the Archaeological Survey of India, the Shveta Varahaswamy temple was constructed in the Hoysala style during the rule of Chikkadevararaja Wodeyar (r.1673-1704). 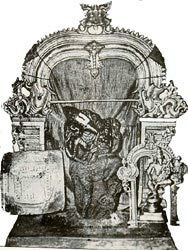 Varaha avatar has a special place because it was the family deity of the erstwhile Mysore Wodeyar family. You can read more about the temple in this blog. There are no photographs of the deity available as photography is banned inside the temple. 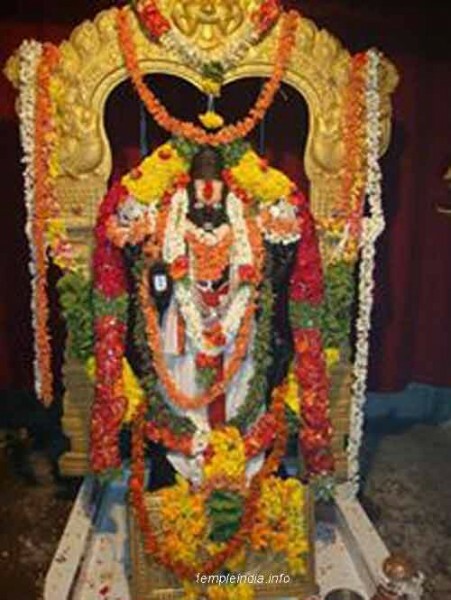 Sreevaraham Lakshmi Varaha Temple is situated at Sreevaraham near Sree Padmanabhaswami Temple in Thiruvananthapuram City. This a west facing Mahakshtera with golden Dwaja Prathishta. 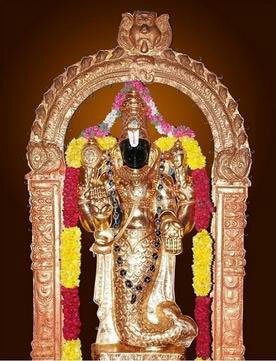 The main deity in sreevaraham temple is Lord Vishnu in Varaha avatar along with Goddess Mahalakshmi on his left lap. The pond infront of the temple is famous as Varaha Theertham. This is one among the Theerthas mentioned in Syanandoora Purana Samuchaya - a Purana describing the glory of Padmanabha Swami Temple. The pond is the biggest temple pond in Kerala (about 8 Acres). A mandapam is located at the centre of the pond. 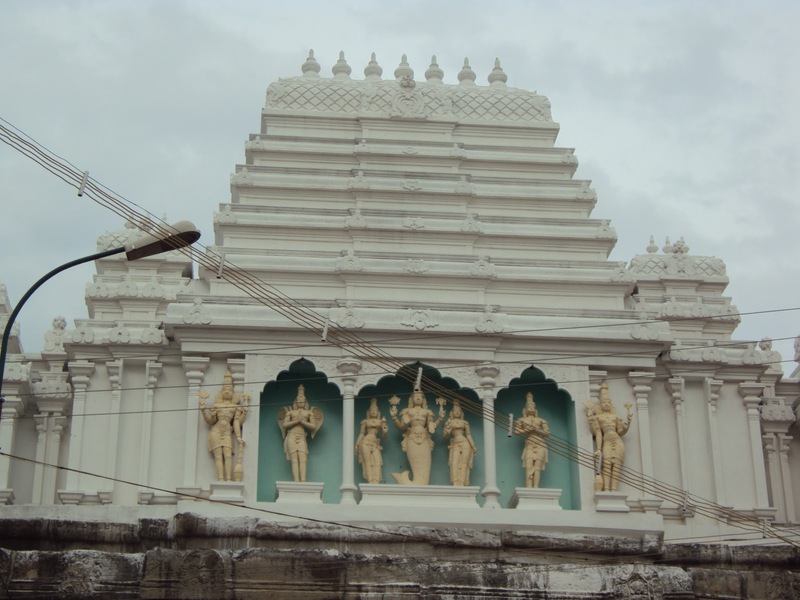 Kunnandan Mahaganapathy temple (facing Sree Varaha Moorthy) is situated at the west side of the pond. Varahtheertham was the bathing place for the Brahmins/Nampoothiris who participated in Murajapam ritual conducted once in six years at Padmanabhaswamy Temple. In ancient days the Karamana river was conneced with Padmatheertham of Padmanabha Swamy Temple and it is connected with Varahatheertham through a canal for maintaining the water quality. The pond was cleaned in 2012 after several years with the help of Thiruvananthapuram Corporation, Travancore Devaswom Board and local people. The pond is big enough to conduct even Vallamkali (boat race). "Information on Varaha Temple Only"
On the South Bank of the Pushkarini tank in Tirumala, next to the main temple is a temple dedicated to Varaha Swamy. 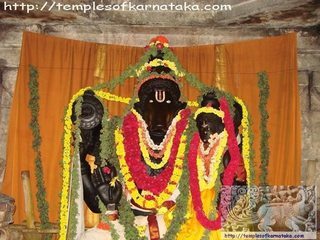 The Sthala Purana has it that the temple was orginally dedicated to Varaha Swamy who resides in a divine vimana over the present temple. Skanda Purana in 'Venkatesha Mahatmiyam' describes Bhoodevi approaching Varahaswamy at his residence in Mount Meru. Varaha Swamy questions Bhoodevi as to what she now requires, since she is securely placed on one of the hoods of Sesha Naga. Bhoodevi requests Varaha Swamy to stay on Earth till the end of Shweta Varaha Kalpa and the Lord obliges. Back to Sthala Purana - When Srinivasa needed a place to stay since His marriage to Padmavati had been solmenised, He met Varaha Swamy. Varaha Swamy willingly agreed to move out of the temple, but wanted to dwell near the Pushkarini Teertha. So Srinivasa requested Him to construct a dwelling for Himself. 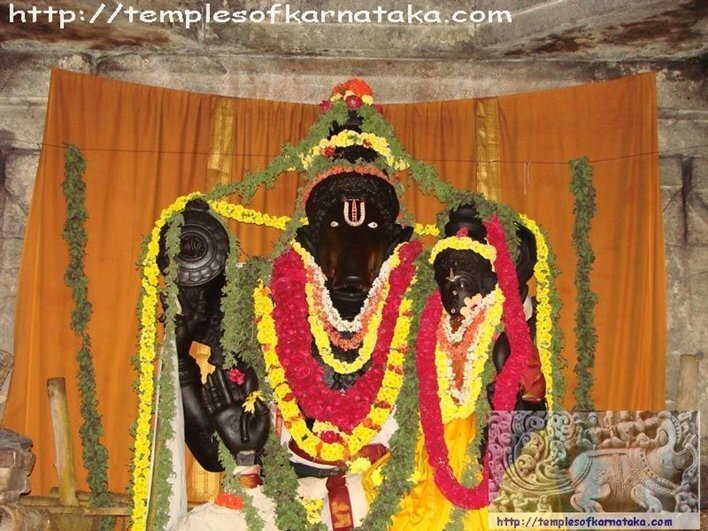 Being obliged to Varaha Swamy, Srinivasa declared that whoever wanted to have His darshan would first have to visit and Have the Darshan of Lord Varaha before coming to Him. This is an important Temple of Varaha Swamy. Not the answer you're looking for? Browse other questions tagged vishnu temple avatars varaha matsya .